When you gather with your family around the Thanksgiving table this year, you can expect to see a few iconic holiday dishes. Most likely there will be a turkey; maybe mashed potatoes, sweet potatoes, corn and dressing. And don’t forget the sweets, there’s cranberry sauce to liven up your savory dishes and also pumpkin pie. These foods are the core of the modern Thanksgiving meal. 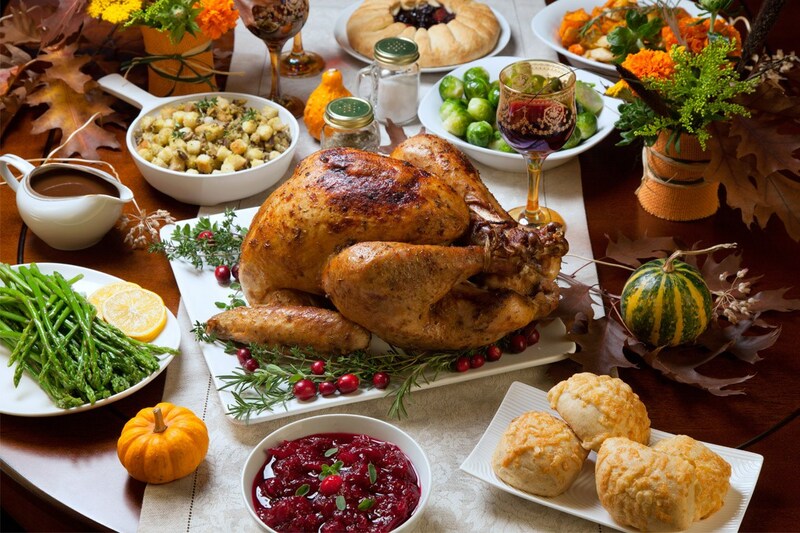 But what if I told you that only one of these tasty treats was actually on the menu at the first Thanksgiving and that most of the foods the Pilgrims and the Wampanoag feasted on are probably not on most people’s tables this season? Today on Beyond Bones we’re going to explore the real first thanksgiving menu and how our modern menus measure up to it. The Pilgrims land in an unfamiliar world. 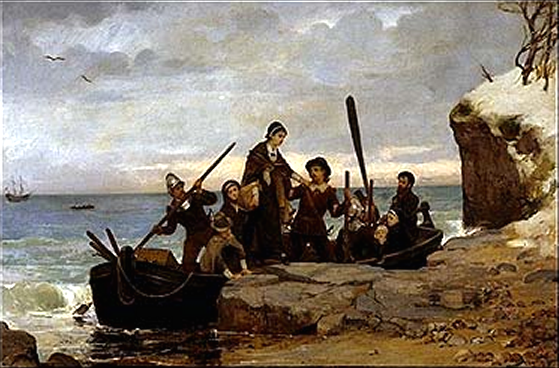 “The Landing of the Pilgrims”. Artist Henry Bacon (1839–1912). Source: Wikimedia Commons. In order to understand the culinary situation the Pilgrims found themselves in, you have to think of them as castaways on some uncharted island, because in a way that’s what they were. When they landed in present day Massachusetts in the Fall of 1620, these European settlers were completely unfamiliar with the native edibles of their strange new home. They were also unsure how to successfully cultivate European crops in the New World. They relied heavily on the support of the Wampanoag, their neighboring Native American society, to gain the knowledge they needed to feed their settlement. So, like the Wampanoag, much of their meals would have consisted of what they could find in the environment around them. Same rule holds for their Thanksgiving feast. Wild fowl, such as geese, ducks, pigeons and turkeys would have made up a lot of the meal. That’s right, turkey is the only thing on our table today that was also featured during the first Thanksgiving feast. Five deer were provided for the celebration by the Wampanoag according to an account by William Bradford, a former governor of the Colony. Seafood would have also made up a large part of the meal as Plymouth settlement was right on the coast of Massachusetts. Imagine sitting down to a plate of lobster, with a side of oysters and fish this holiday. That’s what the Pilgrims did. We are less sure of exactly what side dishes were prepared for the feast because original accounts only mention the various meats prepared and corn, but let’s take a look at the options they would have had. Indigenous crops such as corn, beans, squash and pumpkins would have been available. You heard correct, pumpkins may have made an appearance at the feast, but not in any form our modern eyes would recognize. The popular method of preparation in the early colonies was to take out the insides of the pumpkin, mixed them with milk and honey, put them back in the shell and roast the whole thing to form a custard. There was no flour or butter for bread, so unfortunately no pies. Corn would not have been eaten off the cob, instead the corn grains would be removed, ground and boiled into a sort of porridge, kind of like grits. There may have been onions, cabbages and carrots brought over by the colonist. 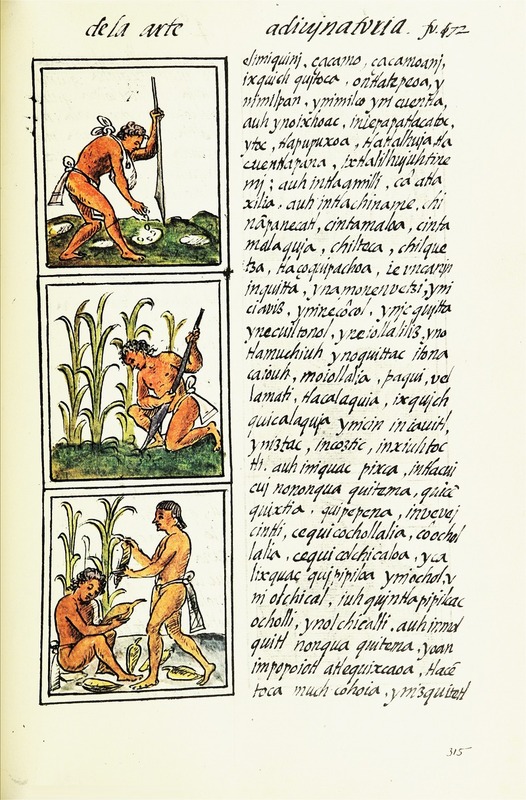 Cultivation of maize in an illustration from the 16th c. featured in the Florentine Codex. Source: Wikimedia Commons. All in all, be thankful for the meal you can expect this Thanksgiving. Not only is it much easier to procure (as difficult as it is to navigate grocery stores during the holiday season, it beats wandering the forests and wading into the frigid ocean) it’s also probably much tastier, considering that we have so many spices to choose from and also we don’t have to deal with unusual pairings like shrimp and grits and venison. Speaking of spices, are you looking to spice up your holiday cheer this year? If so, there’s no better way to do it than visiting the Houston Museum of Natural Science. We have several special attractions open just for the holidays and even for those of you who don’t want to deal with all that humbug, we have our amazing exhibit halls, including the finest gem and mineral exhibit in the world.